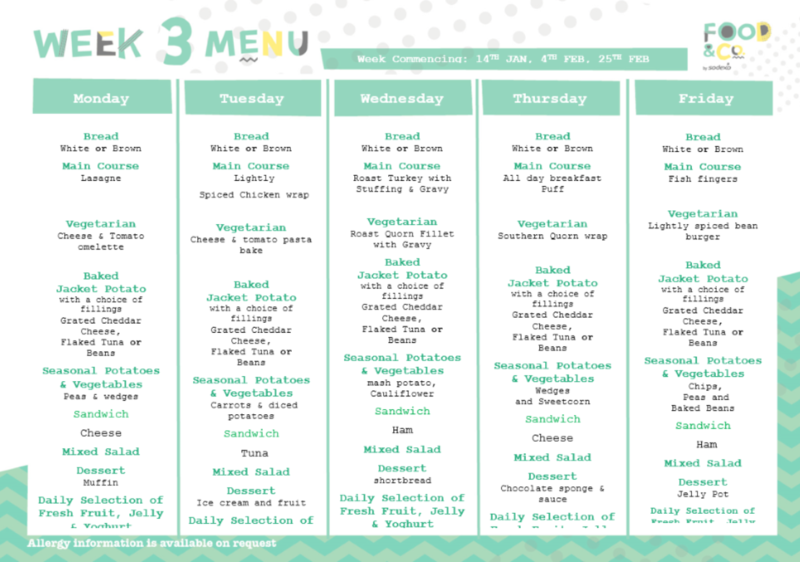 Please take a look at our yummy alternate weekly school dinner menus. From September 2014, all pupils in Reception, Year 1 and Year 2 are encouraged to eat a school meal which is provided free of charge. We encourage all pupils in Foundation and KS1 to take the school meal and refrain from bringing in a packed lunch from home as we are certain that even pupils who can be fussy eaters at home are likely to try a wider range of foods when they are eating alongside their friends in a lunch hall environment. We expect and promote good manners during lunchtime and are well supported by a team of lunchtime supervisors who provide a caring and supportive environment for all pupils. Our dining hall is a dedicated space and provides a spacious, bright and clean environment for your child to enjoy their lunchtime experience. 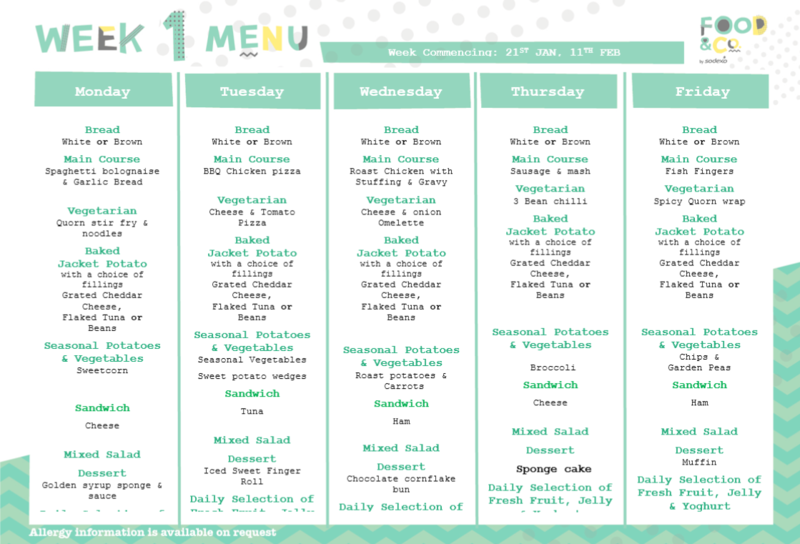 Children are given a choice of different meals, a traditional dinner, a jacket potato with a range of fillings and salads or a lunchbox (sandwich) option. Parents of pupils in Key Stage 2 (Years 3-6) who are not entitled to Free School Meals can, of course, opt to take a school meal for their child. All meals must be paid for in advance at the school office. Please ask at the school office for information about this service, or speak to us if you believe you may be entitled to Free School Meals and would like our assistance. Please note that we cannot maintain an offer of a school meal to pupils where debt arrears have exceeded TWO WEEKS. Parents will be asked to settle the debt so that pupils can continue to enjoy a school meal. Parents can, of course, opt for their child to bring a packed lunch from home. 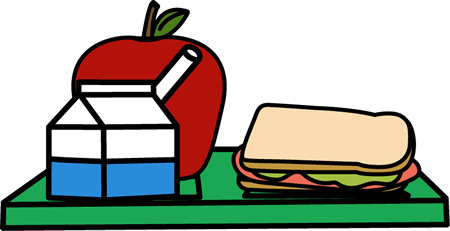 Packed lunches must not contain sweets, chocolate, fizzy or energy drinks of any kind and pupils with these products in their lunch box will be encouraged to save them for home. Additional Snacks are available during the course of the school day. Children in Foundation Stage and Key Stage 1 are provided with fresh fruit or vegetables each day. Small cartons of milk are available daily for all children who wish to partake. There is a termly charge for milk, but milk is provided free of charge to families in receipt of ‘Scheme of Aid’ or for pupils under five years in their first term in school. Children are encouraged to bring water bottles to school containing water only. We have agreed a contract with school meals providers Sodexo to begin our improvements to the school lunches we serve. 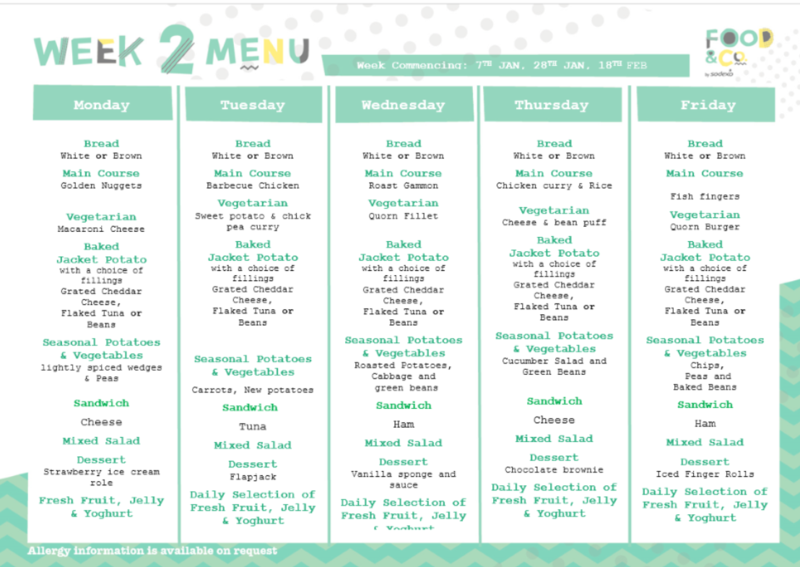 We are excited about the menu – as well as the jacket potato and sandwich option each day, the children will also be able to choose from two hot school meals and hot school puddings with custard! All up to date menus are posted in the school notice boards and are available from the school reception.